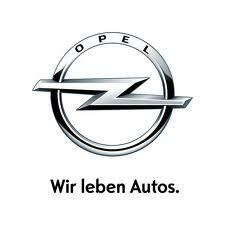 Opel you surprised me! And you got me talking (again)! It has been a while (understatement…) since my last post! Lots of things happened recently: we got a baby, we moved from New York City back to Finland and I got a new job. So, lot’s of excuses not to post anything but I intend to start ‘talking’ again! Recently I had the pleasure to drive an Opel Astra station wagon as rental car. “The pleasure?” you might say? Yes! And I was totally surprised by it myself! Opel has had now for years issues in Europe with their sales numbers. To put it simply: the old Opel way of doing simply did not work anymore: the car business (except Opel) had moved on to more stylish cars, more standard equipment, more car for the money. And with that consumers had moved on as well to Peugeot, VW and Ford (1). I still remember very well the stories of my father when he purchased in 1977 an Opel Ascona B: nothing came with that car as standard equipment… even the passegner door mirror had to be paid for! Eventhough the German quality was admired and respected he was happy to switch in the beginning of the 80’s to a Mitsubishi Galant. The Mitsubishi simply had a-lot of things inside the car standard (interior reading lamp!) and came with a powerful turbo diesel engine. Never since my father returned to Opel and ever since I have seen people around me slowely but surely switching from Opel to another brand. So, why was I so suprised with the Astra? To put it simply: Opel put a well designed and high equiped product on the market! No wonder the Opel Astra is the European car of the year 2010! Think about it: a rental car (cheapest model!) that comes with color screen for radio, board computer and navigation (you do need a navigation CD), parking assistant, cruise control, electric windows (front only…) all wrapped in a well designed, good looking very very spacious wagon (more spacious than e.g. a Volvo V50!) for less than 20.000EUR! I am impressed and have only one remark that did put me a bit off guard and reminded me of the old Opel: with all those standard features how can you not include electric windows in the back? That simply puzzles me. We never stop thinking about new and sustainable ways in which we can positively influence – or energize – people’s lives through every contact with the Opel brand. Lexus LFA 350K sports car: why did Toyota not introduce a new brand? With quite a few posts about car brands lately you might think that I am an actual car enthusiast. Truth to be told: not so much and at this moment I actually do not even own a car! So what is with the interest in the car industry? I simply think there are lots of interesting things happening. 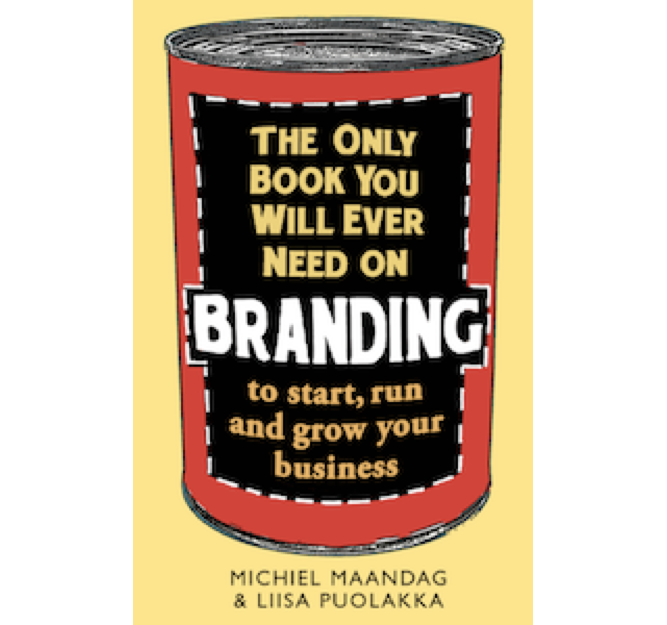 Brands are trying to reestablish, re-associate themselves or find ways to take a bigger bite of the pie. The fact that a comparison with Ferrari was made me wonder as well why Toyota did not opt to create a new brand for these high end sport monsters. Lexus? It simple does not work… this is a different car category than the once Lexus is competing in. With Lexus in the category of high end race cars I am getting confused with Lexus: what is Lexus all about? Would have something like Veloce have worked? I think so! By creating a new brand, let’s say Veloce, Toyota would have had all the freedom to build a high performance race/sports car brand. In fact by doing so, Toyota could stretch Veloce down with models around 100K and compete with the iconic Porsche 911 model, especially now Porsche has given up their unique brand position since focussing on SUVs and 4 door cars. The fact that Veloce is by Toyota is fine, most people also know that Lexus is by Toyota and yet they are happy to pay the extra dollar. At the same time Toyota is racing in the Formula 1 so it has at least some credibility. And finally on colors: Ferrari is red and Veloce could by white. It works very well! White is the color of purity, which works very nice against Ferrari when executed properly. What would you have done as brand manager at Toyota HQ? Let me know your ideas! There is no doubt about it: the Porsche Panamera is a great looking Porsche! It has all the beautiful Porsche design details and it looks way more part of the family than the Cayenne. Until now, you had to choose between a four-door car and a sports car. With the Panamera, the contradictions and compromises end. And that was the moment I realized something was wrong! I would have hoped Porsche would just remained to be that 2 seat super sports car! If you would be interested in a 4 seat sports car you would after all compromise for a Mercedes CLS class or something similar. With wife (or husband) next to you and kids on the back seat there is not going to be so much sports as there would have been with a 911 or Boxter that you would drive alone. Porsche is / was(?) the symbol for sports cars: in my mind 2 seat sports cars. No “sports” SUVs or four-door “sports” cars. There are not many SUVs and four door cars on a race track, for a reason… it’s not really sporty… So, surely, Porsche will make some serious money with the Cayenne and Panamera but the downside is that the Porsche brand imagine has changed in a blimp. It has gone from those desirable high performance sports cars to well…. all kinds of cars with a sporty feel to it. What do you think? Right or wrong line extension? 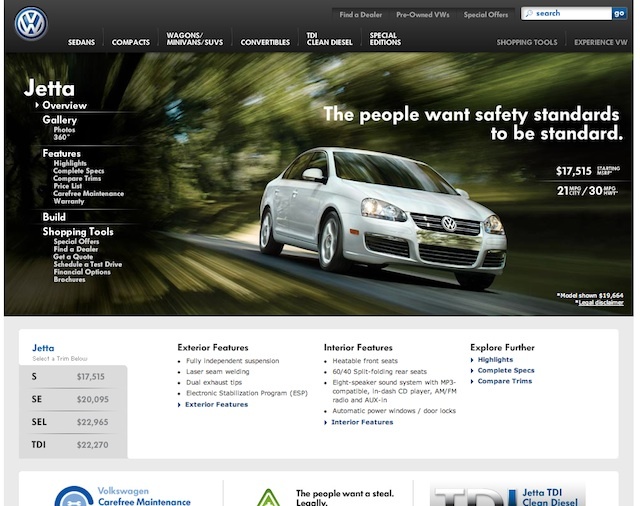 Volkswagen USA: what is happening? Since my visit to the New York auto show in April I have been wondering about the Volkswagen brand positioning here in the USA. In Europe Volkswagen is really positioned as the peoples car and as such their visual identity and communication reflects that. Current website: perhaps too premium design? And... where are the People? 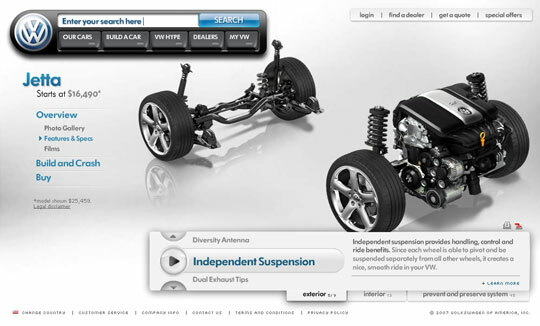 Yes, Volkswagen has made progress from the tough looking old website design to the more approachable current design but it still feels Volkswagen is a bit lost. It is lost in its positioning against Audi, the other brand in the Volkswagen group. 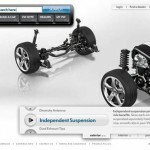 In order to be the people car it should not out win Audi in webpage design. 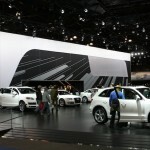 It should also not out win Audi either in big events like the New York Autoshow. It should never out win Audi. 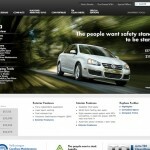 What should Volkswagen do? 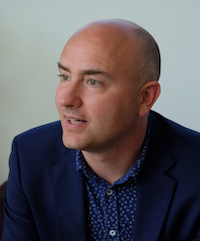 It is of course up to the Volkswagen Group to figure out how to play with Audi, VW and Porsche in their brand portfolio but it is clear that there is some clear overlap at the moment. That is bad, as it will decrease distinctiveness of these wonderful brands against competition. My recommendation would be to bring much more focus on what made Volkswagen big: being the people car and Das Auto! There is a lot to play with when you think of a car for the people. That is, The Car for The People! European car brands are pushing Diesel to the US market. Audi is however taking a very active role. 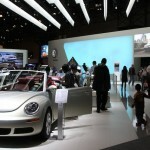 Already at the New York International auto show in February I saw diesel versions of some of the popular models. From there it continued with a campaign site on audiusa.com and last weekend I saw at night an Audi Q7 TDI parked in the hot New York meatpacking district. The car had “TDI” stickers all over so it was clearly there to spark interest. The whole “bringing Diesel to America” exercise is very interesting as it requires US citizens to change their perception of Diesel to succeed. Here is how Audi is doing it. Will it work? I think so. It has been in the works for some time. In 2006 American refiners were for the first time pumping “clean diesel”. Now 3 years later we see the first serious cars hitting the market. I would give it still another three to five years for the infrastructure to build up but after that Americans will drive like Europeans: in the premium/ high end segment on clean diesel.